Believe me, this is not an exercise in self-aggrandisement, but an attempt to discover where I should take the characters next. I will shortly be presenting ideas to my publisher that will bring the old boys’ adventures up to a neat and full twenty volumes. Although you currently have ‘Strange Tide’ in paperback and ‘Wild Chamber out in hardback, I’ve already delivered next year’s book, which will give readers a break from the current complex plotlines – although, as I’ve always pointed out, the books can easily be read out of order. 2018’s ‘Hall Of Mirrors’ is set in 1969 and provides a rather bonkers take on the country house mystery. The books do actually have subtle distinctions in tone, and several volumes are what I call ‘palate cleansers’. These always come after a couple of particularly complex investigations, so ‘White Corridor’, ‘The Memory of Blood’ and ‘The Invisible Code’ are simpler in construction than, say, ‘The Victoria Vanishes’, ‘Off the Rails’ or ‘The Burning Man’. I’d like to get a sense of which type you prefer, or whether a book has struck a particular chord and why. With that research done, I can then choose and discard certain subjects. For example, I have ideas for a wildly busy novel in which the PCU is forced to tackle several cases at once, which could be great break-neck fun, but I’d like to tackle one built around a small, simple human tragedy. Also, as ‘London’s Glory’, the collection of cases, did surprisingly well, I’ll be tackling another Christmas volume at some point. So can I ask you to help me out here, and explain your choice? I’ll run a follow-up post announcing the result. That’s what blogs are for; a bit of proper interactivity! Full Dark House. First one I read and one I go back to the most. Should add that I have read and re-read them all except this years offering as I’ve just finished it. Super book by the way. I’m looking forward to Wild Chamber in paperback (yes I know but I have all the others in paperback and that probably says a lot about my mind) and I like them all for different reasons. Having said that and to avoid a ‘hung parliament’ vote I would probably pick White Corridor and The Victoria Vanishes very slightly ahead of the rest. Please may I give an honourable mention to Soho Black? (Sorry again, I do regard the first three books as part of the series :)). Ok here goes. I like the comnbination of the exploration of the mechanics of an area of London life but also the sadness of individual lives caught up within the machine. Strange tides and the water room was haunting and did have the uncompromising personality of water flowing through it. I’ve enjoyed being taken along for the ride on the multi level books but perhaps a more philosophical cause and effect piece about a character who starts something ( either for best intentions or for petty self interest) that then gets out of control. A lot of small men have been catalysis for huge sea changes e.g. Nigel F. Catch the moment when a country feels like it needs a change but then has to deal with the uncertainty and the fall out. I think a book about mediocrity in times of crisis might hit the right note. If you can find the way that the ordinary people are trying to get by or make sense of things. You balance humour and melancholy well. Londons glory gave me satisfaction of a quick puzzle and snap shot of people’s lives which was a good holiday read. I know when I start a full on Bryant and may I’m in for a commitment to have my life taken over while the story grips me and Londons Glory gave me options on how to enjoy my Bryant and May fix. My favourite is still The Burning Man for the plot and social commentary.The two cases at once is a great Idea;may I suggest that would be a good climax to the series. I’ve read all of the books so far, all in publication order, and each one only once up until now (plan to change that at some point). My favourite has been “The Memory of Blood” simply because it didn’t let up from start to finish, had a great plot, and the ending was perfect, wrapping up so many plot strands at once. If you’re looking for the opposite direction, least favourites were probably “On the Loose” and “Off the Rails”, simply because I can’t remember anything about them at all, and “Strange Tide” which for some reason didn’t engage me as much as some of the others. Did enjoy “Wild Chamber” though. Of the 4 novels I’ve read so far I’d vote for Ten-second staircase (still only on chapter 32.) Most locked-room mysteries become annoying before they finish, but not this one. Really enjoying it. Not an easy question at all to answer. I do like your idea that they tackle several cases at once – could be very compelling. Full Dark House does come straight to my mind probably because it was our first full-length introduction to B&M. Seventy Seven Clocks still stands out. I enjoyed The Victoria Vanishes as it was such a puzzle. The Burning Man was quite dark at times and ensured that I didn’t want to stop reading it. Another graphic novel would be great! And, as always, more short stories would be gratefully received. My favourites for plot were The Victoria Vanishes and The Burning Man. For eerie atmosphere, though, The Water Room would have to be my choice; I could smell the dampness. I agree that White Corridor and On the Loose were rather less memorable. That said, I have enjoyed the whole series and look forward to your future books. The first one I read was The Invisible Code and I loved it – went back to the beginning and read all the books in order. The characters are so strong that they seem like people I know, and I always welcome the opportunity to meet them again. So far I read the first six books. My favourite plot out of the six is definitely The Victoria Vanishes. Nevertheless I love Full Dark House because it was the first time I met Bryant & May. I particularly enjoyed the ones with more mystery, in a locked room sort of way. Hence The Water Room and The Victoria Vanishes. Reminds me to go back to Ten Second Staircase, because it has been a while. Having started them recently as a retirement project I’m only a few along in chrono order, and I’m taking them slowly (for many personal and illogical reasons – I fear if I finish the series, that may be the end for me). So far it is The Water Room – so much of London I didn’t know about in there, and along with JackieH, I could feel and smell the damp seeping in. I also really like the “back stories” of your “minor” characters – they all seem rounded, so genuine and with real motivations to behave the way they do. 1. 77 Clocks: My favorite theme, i.e. certainties of the past…turn into something horrible. But somehow modern, as AI algorithm takes on a life of it’s own. 2. Off the Rails/On the Loose: Arthur rules! Complex but rational plotting and really good writing. 3. Water Room: What flows underneath strikes back. Good idea of river as the main character but the human character wasn’t interesting. 4. Strange Tide: Captured a cultural theme very well. Ending was quite powerful and Arthur was great. 5. The Burning Man. Timely and putting Janice center stage at the end made it more interesting. 7. All else including Full Dark House and Wild Chambers. I find B&M books that are call on old mystery themes, e.g.Victoria Vanishes, less interesting. I read them because they are well-written; I ignore the plot. Hence my lack of excitement about a country house mystery set in 1969 (what a horrible year that was!). But I look forward to being astounded and amazed. Seventy seven clocks, a brilliant book! 77 clocks is the standout for me, for similar reasons to Brooke. I loved the way something long-forgotten could affect events in the present. To tell you the truth, I actually preferred the original Darkest Day – supernatural elements and all. The Water Room is another standout (fascinating facts throughout) and I also liked the single-setting White Corridor, so I’m looking forward to the Hall of Mirrors. One location allows the characters and their personalities to really stand out. And as you’re not describing each location there’s more of the terrific dialogue. Ok,I’ve narrowed it down to Victoria Vanishes, Strange Tide and Seventy Seven Clocks(or The Darkest Day as it was). The complexity of the stories was what I liked,with an especial fondness for Arthur’s struggles with illness in Strange Tide,which had me piping my eye and then cheering! Although not a Bryant and May and novel,I have to add a vote for Rune,in which they appeared. In fact when ‘im indoors wanted to start reading your books,that was the one I suggested. He is now five books in and still going. However, I’ve enjoyed them all – no duffers! Oh this is weird! I’ll wait to see if any more responses come in and post the results (I’m also asking other friends). Pick out a favorite? You must be kidding!! I love this series to distraction so it is hard to just pick one because there is something special about each book. I must say I almost choked when you gave Arthur Alzheimer’s Disease but you really pulled a rabbit out of the hat with the solution to that problem….whew!!! If I have to try and pick a favorite(s) it would probably be Victoria Vanishes and Full Dark House but I might change my mind tomorrow!!! Frankly, I don’t think that you should take Bryant and May out of London for a new book…..London is just as important as a continuing character in the stories as is our beloved PCU. And believe me, when I am in London I always have my eye peeled for an elderly rumpled man with a flowing, tatty scarf and a handsome silver haired fashion plate! I would put Victoria Vanishes first It was the first one I went back and read again after reading most of the others. The rest are great but they shift around in preference. The ones which mirror what is going on in the world are great. I’m fighting with Amazon.uk so I haven’t got the latest yet. Seventy-seven Clocks was one I didn’t care for until the second time through, possibly because the whole concept was so terrifying – and what are we building now that will come back to bite us?. I’m missing Ten Second Staircase so I’m not sure where that fits in my list. I’m havering here while I try to decide what it is I like best. Each one for a different reason, I think, but the characters most of all. The suspension of disbelief where age is concerned is easy, especially as B&M are of my father’s generation, so I just push myself back into his conversation. Younger people would like them for different reasons, of course, but what’s not to like? According to GOODREADS, I thought THE VICTORIA VANISHES was the novel I enjoyed the most. Likely because I also enjoy Edmund Crispin and THE MOVING TOY SHOP is my favorite of his work. My first Bryant and May was ‘Off the Rails’. I then went backwards in no particular order. This is just too hard to decide one favourite book. The Water Room, and The Victoria Vanishes are favorites for mood and atmosphere. But I think if I really, really had to pick one on threat of harm to life or limb, the On the Loose/Off the Rail combo would have to get my vote because of continued character development and the quality time spent with the whole ensemble. I love all the characters and really want equal time with everybody. Incidentally, my 15 year-old son has read as far as The Victoria Vanishes and was particularly fond of Ten Second Staircase, so there’s another country heard from. He really loves loves the series. We’ve had great talks about the books so thanks for that. I loved 77 clocks but then I thought Darkest Day was a fantastic novel and I actually prefer the original. The Victoria Vanishes was also good. Not so keen on the White Corridor, its the only one I’ve never been able to finish. Full dark house and the Water Room are both excellent and all of the recent ones have been great. 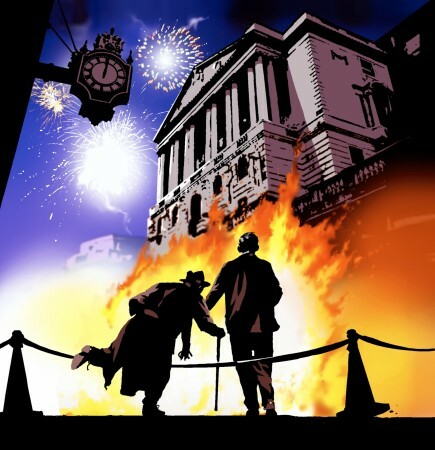 The first B&M I read is not even officially part of the series, but I think it’s simple, direct, great fun, and has loads of London lore – Disturbia. It made an impact and I wouldnt mind another in that vein. Equally, Strange Tide was rather special for me. If every B&M was the same I probably wouldnt be here now – keep surprising me! Sorry I just realised that probably wasnt very helpful! So: you needto keep attracting new readers, plus retain and amuse the existing readership. So: Keep exploring London, keep exploring new forms, keep creating memorable characters. I think it’s probably the simple direct stories that grab new readers who will then explore into the series. Xmas short stories probably ideal for that. Next time you ask, try using a survey tool or excel. Both programs will organize the comments into themes and rank order in terms of frequency.. Or is this too much vertical thinking? Love all the B&M stories but have always had a soft spot for The Victoria Vanishes. After a recommendation by your good self read Edmund Crispin’s The Moving Toyshop in a similar vein that I enjoyed very much. Notice a few others have mentioned one of your earlier novels Soho Black – another big favourite of mine for what it’s worth! I love this series because I absolutely love these two detectives as well as the regular staff members. Reading each new book is like spending time with old friends or mildly annoying family members! I find myself laughing out loud as I anticipate their reactions/responses. So really any story in which I get to hang out with the PCU gang is enjoyable. I like learning about London as well. 1. Full dark house, because as someone else said we first meet everyone, and also the intriguing way the story starts… you’re wondering how can there be any additional stories. I love all of them but my favorites are The Water Room, Off the Rails, The Bleeding Heart, Seventy Seven Clocks, and the short stories. I love how the past influences the present. The mysteries are well plotted and the characters are richly drawn. London’s history is a character that never fails to surprise. It saddens me that you have an end in sight. My life is richer for having encountered Bryant & May. I would love for Bryant to write a London guide book, as nonfiction it wouldn’t count as part of the 20 in the series. Like quite a few others above, my favourite is The Victoria Vanishes. I think this is because a) the scale of the overarching problem (a vanishing pub) is so large, and b) whilst all the books relate information about the hidden London and London past, this one seemed to do so in spades, so was particularly interesting in this regard. If it helps at all, it would also be good to see some stories where the PCU wasn’t under threat of closure — whilst this does add a sense of jeopardy and/or necessary urgency, I do sometimes find myself thinking “oh, not again”. Sorry! I would definitely like to see a story that takes both B&M completely out of their comfort zones (if they have such a thing). Perhaps this might be due to them investigating a crime not in London, but somewhere else entirely; or even one where technology is intrinsically linked to the case. I had a dream some time ago where B&M were investigating a series of deaths that seemed to be caused by the victims each reading a strange message on Twitter, much in the style of The Ring (but then wasn’t at all). I’ve read all the books in the series that are available in Canada (we always lag behind by about a year). My very favourite is The Water Room. I particularly enjoyed the underground river aspect. My second favourite is The Victoria Vanishes. This was the first book I read in the series (after that I read them in order) and I loved it! The reveal was a big surprise. Least favourite was White Corridor, although still a good read. I’d really like to see the PCU start to get some recognition from the rest of the force. 1 The ‘Quiet London’ series of books by Siobhan Wall – I expect some of the sites described may have vanished or changed out of all recognition but I still enjoy the descriptions and photographs. 2 The ‘London Nobody Knows’ books written and illustrated by Geoffrey Fletcher, does anybody remember the 1960s film of the same name and subject matter with James Mason as the tour guide? Memories of goldfish in glass toilet cisterns in a public loo and so on. 3 The ‘Joey’ books by Robert Martin. I received ‘Joey and the Mail Robbers’ as a young lad and later discovered the other 18 books in the series, describing the adventures of Joey and his pals around the Covent Garden and City of London areas in the 1950s and early 1960s. 4 and finally a personal indulgence – my friend Jerry Dowlen has written a couple of charming books about his time working in reinsurance in the City of London, the descriptions of buildings and sites that he has enjoyed over his working life. I suppose I shouldn’t mention that they are published by Cray150 publications so I shan’t. I actually retire in three weeks time so am looking forward to not getting up at 4.30 every weekday, although it is my favourite time of the day, and catching up with my reading, especially more Bryant & May. How was that for going round in a big circle? London nobody knows – taped it off tv about 20 years ago, think i hopefully copied it to a dvd somewhere. Along with LWT Making of Modern London and a few others. Off the Rails. London is such an important character in the books and I particularly enjoyed “the knowledge” about London in this book. All of them, especially the later ones, although The Victoria Vanishes was special. Loved Wild Chambers,, by the way. I love the way the same subsidiary characters pop up again and again and, as with B&M, I never feel I can get enough of them. I love London, and, as people are saying, please don’t take your characters away from their home town – it feeds them. If you take them out, London will be the poorer, and so will I. Thank you, Christopher. Hard to choose. Loved the Victoria Vanishes, but the later books are terrific, too. Bryant & May Nominated For ‘Best Detective Duo’!